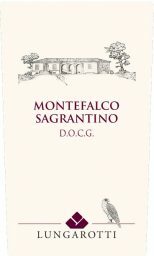 Sagrantino is an indigenous variety of Umbria with an exceptional concentration of polyphenols. Terroir: 100% Sagrantino obtained from massal selection and harvested mid-October. Double spurred cordon; 5000 vines/hectare; yield 6000 kg/hectare. Sourced from plots with southwest exposure, with soils with loose with sandy-clayey texture, limestone subsoil and not very deep. Vinification: Stainless steel fermentation with 28 days of skin contact; aged 12 months in barriques followed by three years of bottle refinement. Certified organic from the 2014 vintage. Limited production of 20,000 bottles. Ample and complex, it immediately expresses a range of red fruit (black cherry, bilberry) with elegant notes of cocoa and sweet spices. The aromas are very long and harmonious. On the palate, the wine has a powerful structure with good concentration and freshness of fruit. Fragrant acidity and dense, mature tannins develop, as the wine ends with a long-lasting finish. "Delicate spice and smoke notes wind through the flavors of baked plum, dried fig and tobacco in this full-bodied red, with dense tannins that are pleasingly plush in texture. Offers a lingering, savory finish. Best after 2020." "Fascinating aromas of dried meat, berries and spice. Full body, round and soft tannins and a flavorful finish. Tannic yet extremely attractive. Not for the weak-hearted. Drink now."